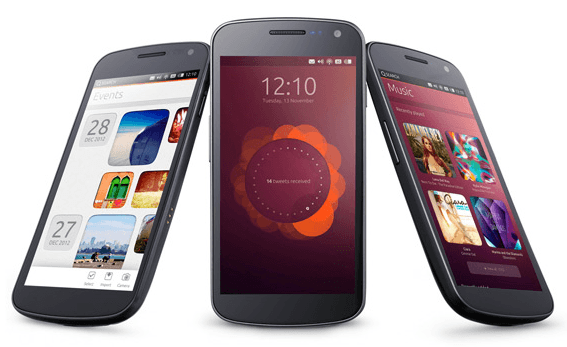 Today, Ubuntu (a major distro for Linux), has announced its upcoming operating systems for smartphones. It is based off of the Android kernel and drivers, but will not run on Java Virtual Machine (JVM), which means it should offer a smoother experience on lower end hardware. It will also support both ARM and full x86 processors. We can expect to see full Ubuntu phones in 2014, and ports for other Android phones available sometime this year. The first officially supported port will be available for download on the Galaxy Nexus phone within the next few weeks. Ubuntu’s handset interface is bringing a few unique features to separate it from the competition. Thumb gestures from the edge of the screen will play a big role in navigation — Canonical says that swiping in from the four different edges of the screen will let users switch apps and search for content. That search functionality will include global search across apps and content on the device; it sounds similar to the famed “just type” universal search in webOS. Ubuntu will also have its own voice commands built-in — Canonical says that voice and text commands will work in any application. The operating system’s historical roots on the PC won’t be forgotten, either, as Ubuntu phones will be dockable with a monitor, keyboard, and mouse. Take a look at Ubuntu’s design page for more information about their swiping gestures. You can view more information on Ubuntu’s website here.